Sprintbit File Manager offers a few file Selection methods. All of them are available from the Selection button menu and some of them are also available in the File Browser toolbar. 1. It has a menu where from you can execute all select commands. 2. You can click directly on big button's icon to execute the default Select All action. 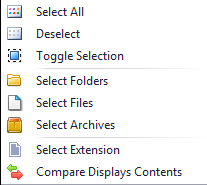 Click on this button to compare files existence between two File Browsers. If any file exist in other File Browser it will be highlighted.